Possibly one of the biggest worldwide concerns is that of the longevity of a healthy planet. As humans there are a long list of things which generation after generation has done to harm the world. However, the strive to reverse the effects of Global Warming are hot on consumer and company minds alike. And this is why we have seen such a great advance in technology and alternative methods of creating products and services which help us give back to the environment. High quality sportswear is always in demand which means that we often see brands compromising on the ethical processes of creating clothing to be more cost effective. This is because often sourcing alternative methods require further research and are a fairly new concept in the clothing making industry. One of the core pieces of fibres you will find in most sportswear is polyester. This is because polyester is cheap and versatile when it comes to production. However, the process of creating polyester clothing is very damaging on the environment. This is because it is believed to require over 70m barrels of oil a year to process polyester and keep up with the demand. 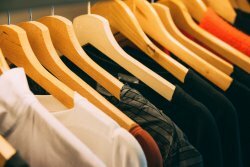 However, with the recent movement of consumers looking for sustainable and ethically sourced clothing, we will begin to see the creation of pure polyester drop. One brand leading the way for this at the moment is Adidas. For a while now they have produced a wide range of sportswear using recycled polyester which re-purposes polyester fibres to keep the effects of pure production down. They have also recently partnered with Parley for the Oceans on a project where they gather plastic from the sea beds, shores and beaches to prevent it from reaching the water and use them to make their clothing. Carrot Banana Peach – Eco-friendly yoga pants made from plant fibres e.g. bamboo, soybean, aloe vera and organic cotton. Botanica Workshop – Swimsuits and clothing made out of organic cotton, recycled nylon and low-impact synthetic dyes. Davy J Swimwear – Manufacturing swimwear using 100% regenerated nylon yarn and encourages shoppers to return suits at the end of its life so that they can recycle the fabric to make more costumes. Manduka – Yoga clothing made using recycling polyester and organic cotton. They also produce yoga mats out of biodegradable natural tree rubber. Vivobarefoot – Turns plastic bottles into high performance training shoes. It takes an estimated 17 plastic bottles to create a pair of durable footwear. Starseeds – Uses recycled polyester and waste coffee grounds to produce fitness leggings. The recycled polyester combined with the coffee fibres allows the material to absorb odour and reduce moisture – just like the well-known brands’ technology I.e Dri-Fit, Climalite, DryCELL, CoolGear etc. When it comes to travelling to work, we often take the convenience of having a car for granted, however we often aren’t aware of the effects this has on the depreciating environment. The emissions caused by petrol and diesel cars are astounding. This is why a lot of car manufacturers are increasing the advancement of hybrid and electric cars to reduce the effects of diesel and petrol cars. Being mindful about your travel to your job could greatly improve the health of the Earth’s atmosphere by simply choosing to walk, cycle or take public transport rather than starting up your engine and hitting the road solo. 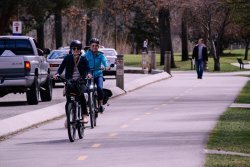 The appeal of improved health and fitness through walking and cycling is influencing a number of people to start switching up their regime to further the reduction of Global Warming’s effects. Along with advancements in exercise clothing, there has also been changes to equipment which will help reduce the impact of high energy and electricity consumption. Most gym equipment runs off electricity to power it, and one of the most popular to use is a treadmill. When making treadmills, SportsArt has taken the consumption of electricity into consideration when designing their new equipment. And because of this, they opted to create a treadmill which uses your walking or running movements on the apparatus to power it by generating electricity. Reports claim that the treadmill can produce up to 200 watts of electricity per hour of straight usage. 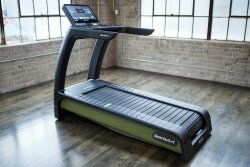 They have currently made two types of treadmill which are the Verde which still requires a small amount of electricity via the mains, and the N685 which relies solely on your running power to keep it going. So how does the SportsArt treadmills work you ask? There is a micro-inverter inside the machine, which are tiny devices that are often used in solar panels and wind turbines. What they do is, they convert harnessed direct current (DC) into alternating current (AC) which can be transported to the grid. Recycled plastic can not only be used for creating sportswear, but it can also be used to create new plastic bottles. A wide range of brands have produced high quality re-usable water bottles out of recycled plastic from old bottles and containers. 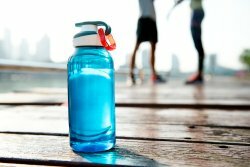 So when you are on the lookout for a new bottle, be sure to have a look for once which has been made from reused plastic or one which is re-usable compared to those you would throw away at the end of your workout or run. Also, if you find yourself in the supermarket or local shop after forgetting your water on your walk or run, you can purchase drinks in more environmentally friendly packaging. Some brands sell water or other juice drinks in cardboard box containers. These are highly recyclable, so when you are outdoors you can make use of the areas’ dedicated recycle bin or take it home with you to place in the correct bin. In this article we have covered four ways in which the fitness community is evolving to aid the reversal of Global Warming. From sports clothing and equipment, to adapting your daily commute the possibilities are endless when it comes to making simple changes in your life. Just a few examples of these you can do without having to workout is to introduce the usage of solar panels, reduce your plastic wastage or even by consciously recycling. If this blog post has inspired you to make changes in your routine or have you discovered a new way in which fitness can help save the world, then get in touch. You can find us over on our social media pages! 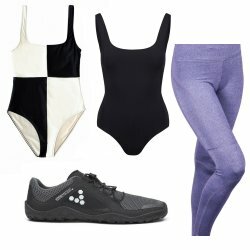 You can also shop our fantastic range of exercise clothing and equipment over at our online store – Sports Fitness.